I chose German when I was looking for a foreign language to study in high school. My sister was taking Spanish with an online Spanish course. I was a little bit torn between the two languages as I love both Spanish and German (and many others for that matter)! But German appealed to me more and won out. So she said, “Alright German it is!” My parents are very supportive and encouraging in the things we are interested in, so right away we went online and began searching for online German teachers. What came up was German school online and four teachers including Frau Ursula Schöneich. My Mom and I read her bio and called Frau Schöneich. We were really impressed and chose her. At first when I started German I just did it because I really liked the sound of the language, the people, and their culture. German culture is so interesting and has many similarities to my Jamaican culture. But now I realize the many endless possibilities knowing German has! I’m not exactly sure where God will lead me in using the language in my future studies as I would like to be either a horse trainer or a veterinarian, but I do know that I want to use German to teach the many people who speak the language about Jesus and Heaven. Frau Schöneich makes sure to thoroughly teach me the history behind each of the many different topics we study and she is so understanding when it comes to my busy farm life. I really lucked out when I got her as my teacher! Maybe someday in the future I will use my knowledge of German and become a Dolmetscherin as well as a horse trainer and Veterinarian! Ich habe mich für Deutsch entschieden, als ich auf der Suche nach einer Fremdsprache für das Gymnasium war. Meine Schwester nahm Spanisch mit einem Online-Spanischkurs. Ich war ein wenig hin- und hergerissen zwischen den beiden Sprachen, da ich sowohl Spanisch als auch Deutsch (und viele andere) liebe! Aber die Deutschen haben mich mehr angesprochen und gewonnen. Also sagte sie: “In Ordnung, Deutsch ist es!” Meine Eltern sind sehr unterstützend und ermutigend in den Dingen, die uns interessieren, also gingen wir sofort online und begannen nach Online-Deutschlehrern zu suchen. Was dabei herauskam, war die deutsche Schule online und vier Lehrer, darunter Frau Ursula Schöneich. Meine Mutter und ich haben ihre Biografie gelesen und Frau Schöneich angerufen. Wir waren sehr beeindruckt und haben uns für sie entschieden. Als ich mit der deutschen Sprache anfing, tat ich es nur, weil mir der Klang der Sprache, der Menschen und ihrer Kultur sehr gut gefiel. Die deutsche Kultur ist so interessant und hat viele Ähnlichkeiten mit meiner jamaikanischen Kultur. Aber jetzt erkenne ich die vielen unendlichen Möglichkeiten, die Deutsch hat! Ich bin mir nicht sicher, wohin Gott mich in meinem zukünftigen Studium führen wird, da ich entweder Pferdetrainer oder Tierarzt werden möchte, aber ich weiß, dass ich Deutsch benutzen möchte, um die vielen Menschen, die die Sprache über Jesus und den Himmel sprechen, zu lehren. Frau Schöneich sorgt dafür, dass ich die Geschichte hinter jedem der vielen verschiedenen Themen, die wir studieren, gründlich kennen lerne und sie ist so verständnisvoll, wenn es um mein geschäftiges Bauernleben geht. Ich hatte wirklich Glück, als ich sie als meine Lehrerin bekam! Vielleicht werde ich eines Tages meine Deutschkenntnisse einsetzen und Dolmetscherin sowie Pferdetrainerin und Tierärztin werden! 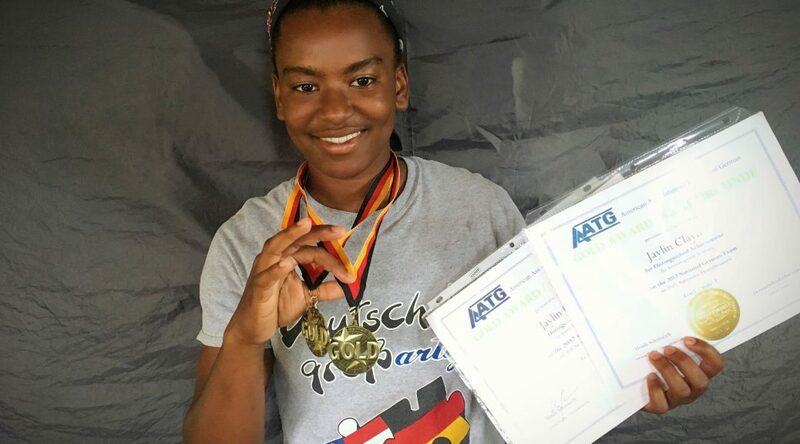 He mastered the AATG Exam 1 with Gold in 2015. 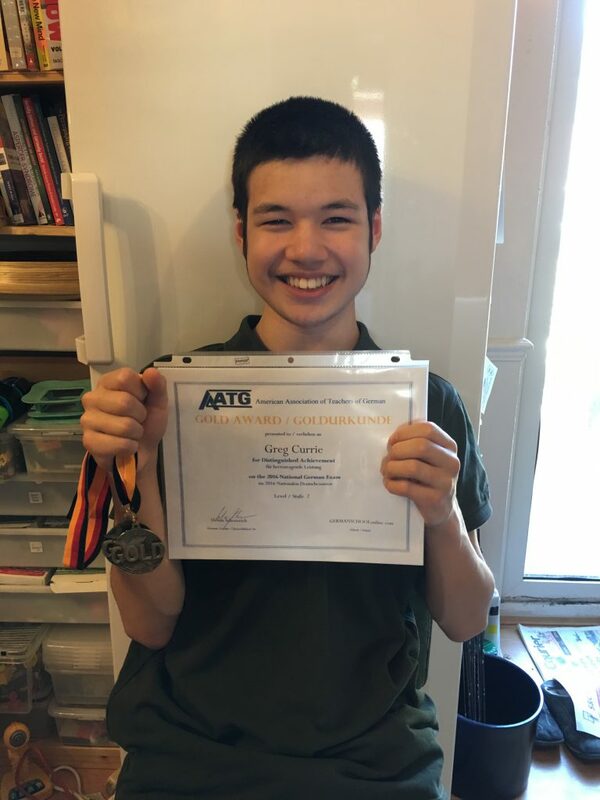 He mastered the AATG Exam 2 with Gold in 2016. I am very proud of him. Way to go. What is a foreign language worth? My oldest daughter is a college freshman, and not only have I paid for her to study Spanish for the last four or more years — they even do it in grade school now! — but her college is requiring her to study EVEN MORE! What on earth is going on? How did it ever get this far? … Or to put it in economics terms, where is the ROI? To sum up the podcast’s answers, there are pros and cons to language-learning. The pros are that working in a foreign language can make people make better decisions (research Johnson covered here) and that bilingualism helps with executive function in children and dementia in older people (covered here). 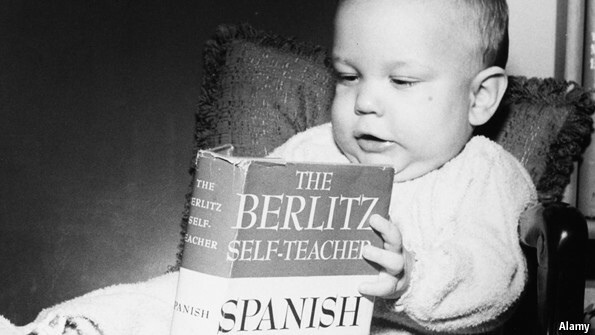 The cons: one study finds that the earnings bonus for an American who learns a foreign language is just 2%. If you make $30,000 a year, sniffs Mr Dubner, that’s just $600. Second, Albert Saiz, the MIT economist who calculated the 2% premium, found quite different premiums for different languages: just 1.5% for Spanish, 2.3% for French and 3.8% for German. This translates into big differences in the language account: your Spanish is worth $51,000, but French, $77,000, and German, $128,000. Humans are famously bad at weighting the future against the present, but if you dangled even a post-dated $128,000 cheque in front of the average 14-year-old, Goethe and Schiller would be hotter than Facebook. Why do the languages offer such different returns? It has nothing to do with the inherent qualities of Spanish, of course. The obvious answer is the interplay of supply and demand. 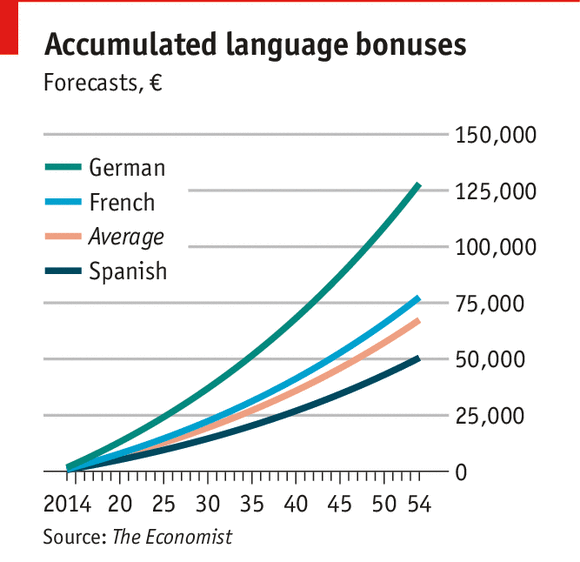 This chart reckons that Spanish-speakers account for a bit more of world GDP than German-speakers do. But an important factor is economic openness. Germany is a trade powerhouse, so its language will be more economically valuable for an outsider than the language of a relatively more closed economy. But in American context (the one Mr Saiz studied), the more important factor is probably supply, not demand, of speakers of a given language. Non-Latino Americans might study Spanish because they hear and see so much of it spoken in their country. But that might be the best reason not to study the language, from a purely economic point of view. A non-native learner of Spanish will have a hard time competing with a fluent native bilingual for a job requiring both languages. Indeed, Mr Saiz found worse returns for Spanish study in states with a larger share of Hispanics. Better to learn a language in high demand, but short supply—one reason, no doubt, ambitious American parents are steering their children towards Mandarin. The drop-off in recent years in the American study of German might be another reason for young people to hit the Bücher. And studies like Mr Saiz’s can only work with the economy the researchers have at hand to study. But of course changes in educational structures can have dynamic effects on entire economies. A list of the richest countries in the world is dominated by open, trade-driven economies. Oil economies aside, the top 10 includes countries where trilingualism is typical, like Luxembourg, Switzerland and Singapore, and small countries like the Scandinavian ones, where English knowledge is excellent. There are of course many reasons that such countries are rich. But a willingness to learn about export markets, and their languages, is a plausible candidate. One study, led by James Foreman-Peck of Cardiff Business School, has estimated that lack of foreign-language proficiency in Britain costs the economy £48 billion ($80 billion), or 3.5% of GDP, each year. Even if that number is high, the cost of assuming that foreign customers will learn your language, and never bothering to learn theirs, is certainly a lot greater than zero. So if Mr Saiz had run his language-premium study against a parallel-universe America, in which the last half-century had been a golden age of language-learning, he might have found a bigger foreign-language bonus (and a bigger GDP pie to divide) in that more open and export-oriented fantasy America. And of course greater investment in foreign-language teaching would have other dynamic effects: more and better teachers and materials, plus a cultural premium on multilingualism, means more people will actually master a language, rather than wasting several years never getting past la plume de ma tante, as happens in Britain and America. To be sure, everything has an opportunity cost. An hour spent learning French is an hour spent not learning something else. But it isn’t hard to think of school subjects that provide less return—economically, anyway—than a foreign language. What is the return on investment for history, literature or art? Of course schools are intended to do more than create little GDP-producing machines. (And there are also great non-economic benefits to learning a foreign language.) But if it is GDP you’re after, the world isn’t learning English as fast as some people think. One optimistic estimate is that half the world’s people might speak English by 2050. That leaves billions who will not, and billions of others who remain happier (and more willing to spend money) in their own language. Seit wann gibt es das Oktoberfest? Zu welchem Anlass wurde es zum ersten Mal gefeiert? Zur Hochzeit von Kronprinz Ludwig von Bayern mit Prinzessin Therese von Sachsen-Hildburghausen. Woher hat die Theresienwiese ihren Namen? 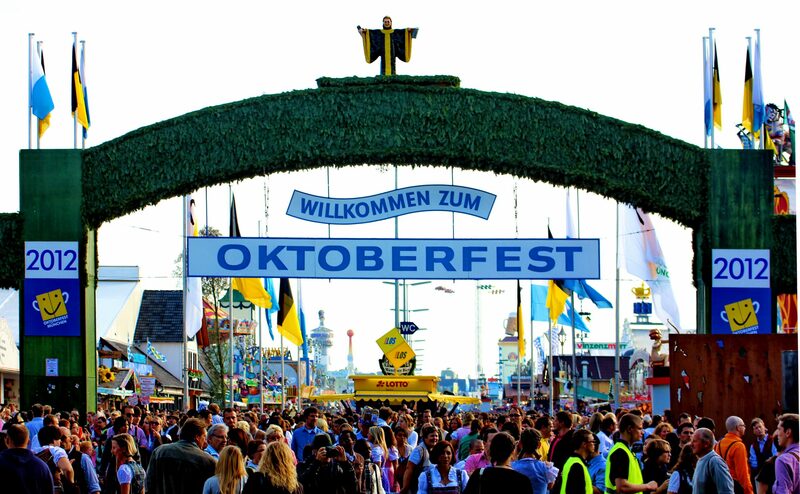 Die Stadt München legt fest, dass das Oktoberfest jedes Jahr gefeiert wird. Erster Trachtenumzug zur Silberhochzeit von Ludwig und Therese. Buden und Zelte werden zum ersten Mal mit elektrischem Licht beleuchtet. Die erste Hendlbraterei wird eröffnet. Wirte und Schausteller fahren zur Eröffnung zum ersten Mal gemeinsam zur Festwiese. Größtes Bierzelt der Welt mit 12.000 Plätzen zum 100. Geburtstag des Oktoberfestes. Der Oberbürgermeister zapft zum ersten Mal das erste Fass Bier an. Die „Ruhige Wies’n“: Erst ab 18 Uhr darf in den Zelten Partymusik gespielt werden. 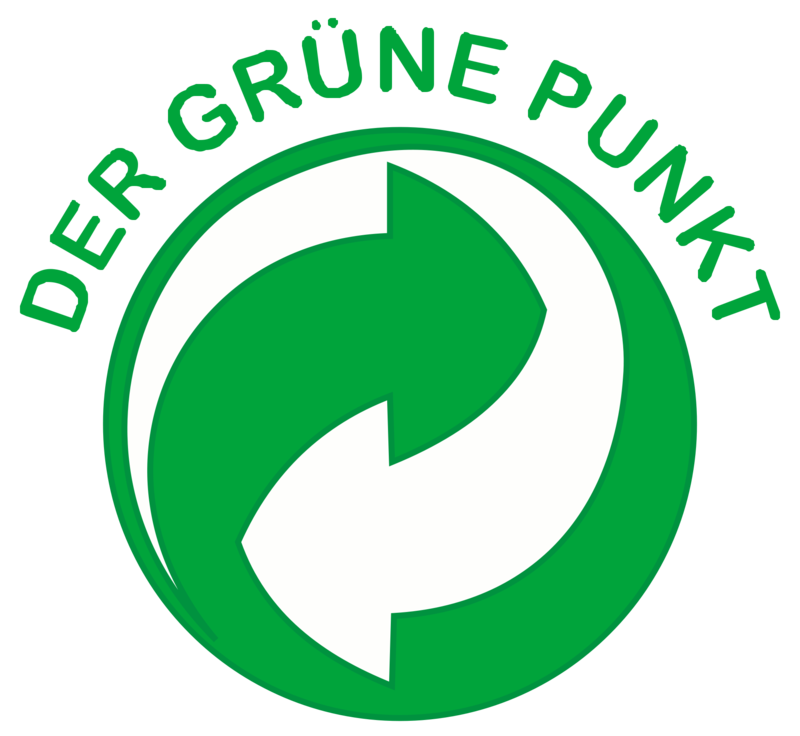 Vor ziemlich genau 25 Jahren wurde die deutsche Bevölkerung mit dem Grünen Punkt bekannt gemacht. 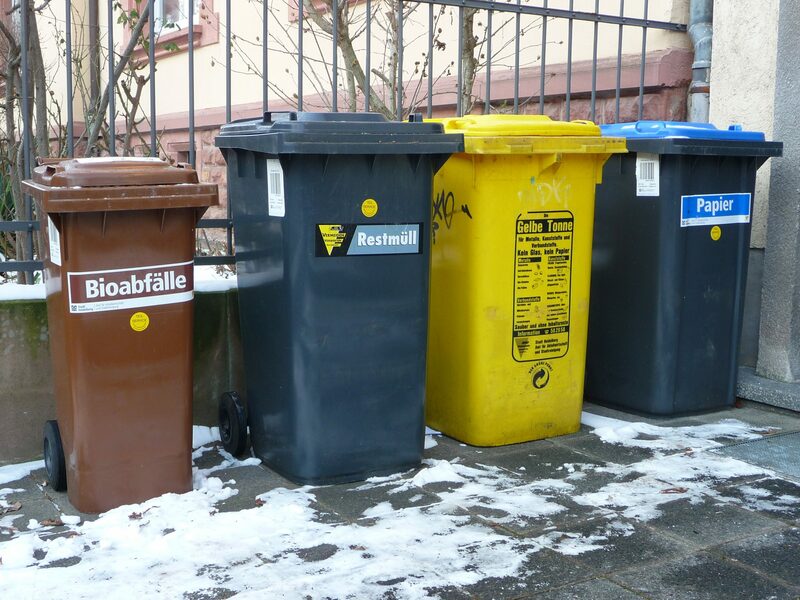 Seine offizielle Einführung im Jahr 1990 wurde begleitet von dem Ausbau eines modernen Recycling-Konzepts und dem Erscheinen der uns nur allzu vertrauten bunten Mülleimersammlung vor unseren Häusern. Die Erfolgsgeschichte der deutschen Recycling-Kultur hat allerdings eine durchaus dunkle Vorgeschichte, die jede moderne Nation nur zu gut kennt. Heute hat man Schwierigkeiten es sich vorzustellen, doch in den achtziger Jahren – vor dem großen Auftritt des Grünen Punktes – türmte sich förmlich der Müll in Deutschlands Deponien. Plastik war allgegenwärtig und trug einen wesentlichen Teil dazu bei. Zur gleichen Zeit war natürlich niemand sonderlich darüber erpicht, neue Deponien in seiner Umgebung den Betrieb aufnehmen zu sehen. So wurde dem damaligen Umweltminister Klaus Töpfer klar, dass strenge Maßnahmen notwendig waren, um das Problem so effizient wie möglich zu bekämpfen. 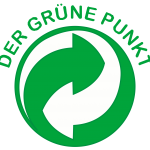 So kam es, dass den Produktherstellern vorgeschrieben wurde, dass sie von nun an selbst dafür zuständig seien, ihre Verpackungen nach Nutzung durch den Verbraucher zurückzunehmen und umweltschonend zu recyceln. Um die Hersteller allerdings nicht zu zwingen, selbst die Verwertung durchführen zu müssen, wurde die „Duales System Deutschland AG“ (DSD) gegründet. Mit einer großangelegten Kampagne wurden dann, nach und nach, die Bürger sowie die Produkthersteller umerzogen, das neu aufgelegte Konzept der Mülltrennung eingeführt, und der Müll begann zu zirkulieren. 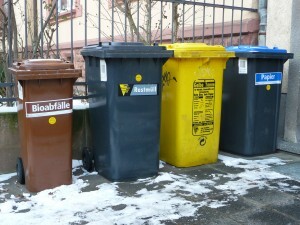 Deutschland hat inzwischen eine Recyclingrate von 62% erreicht (USA 34%). Dieser Erfolg führte dazu, dass der Grüne Punkt, die bunten Mülltonnen und das getrennte Sammelsystem, für das sie stehen, heutzutage zu einem erfolgreichen Exportgut floriert sind, und das grün-weiße, Ying und Yang-ähnliche Siegel in ganz Europa auf Verpackungen zu finden ist. Das war ein kleiner Einblick in eine deutsche Erfolgsgeschichte, die nicht nur den Alltag der Deutschen nachhaltig geprägt hat, sondern den von ganz Europa. The G7 Summit 2015 in Schloss Elmau will focus on the global economy as well as on key issues regarding foreign, security and development policy. Additionally the UN conferences to be held in 2015 as well as the post-2015 agenda will be discussed. The leaders of the G7 countries will also discuss energy security, including as part of the Rome G7 Energy Initiative. The G7 Energy Initiative for Energy Security was launched at a meeting of the energy ministers of the G7 countries held in Rome in May 2014, at which agreement was reached on more joint measures to boost energy security. The leaders of the G7 countries then approved the principles of and measures under the Rome G7 Energy Initiative at their summit in June 2014. In addition, they will continue the ongoing G7 process in regard to development policy. The President of the United states learned some German to greet the people in Krün. For Germans the Spargelzeit, or the white asparagus season, is an eagerly anticipated sign of spring. Depending on the weather, the season for asparagus begins some time in April and lasts until St. John the Baptist’s feast day June 24, and during this time the country is gripped by ‘Asparagus Fever’. Everything comes with asparagus in the restaurants, the farmer’s markets offer abundance of asparagus (most of which is white, not green as we are used to in USA) – small and large, and any other supporting products that are used in the making of the asparagus dishes, like the Hollandaise sauce. The Hollandaise sauce is the main and most popular sauce used to serve the white asparagus with, and, to tell you the truth, it goes very well with it. It can be bought in a box or made at home from scratch. The Germans consider asparagus – a royal vegetable that is why it’s served in some of the best restaurants and homes in the country. However, it wasn’t until it was discovered in Asia that asparagus was even considered to be ‘edible’. Around 2,000 years ago, green asparagus spread from Asia to the countries surrounding the Mediterranean Sea where it became a delicacy. At the time the word ‘asparagus’ was used by the Greeks for most stalk type vegetables but eventually described just this one, which the Romans transported, together with many other plant species, when crossing the Alps to conquer northern Europe’s ‘uncivilized’ tribes. However, there was a time when asparagus fell out of favor. It was after 300 AD and it was ‘gone’ until the 11th century, when it was brought ‘back’ to existence after it’s been used as a medicinal herb usually grown in German monastery gardens and prepared by monks. But it wasn’t until the reign of Louis XIV – the French Sun King – who found asparagus to be up to his taste, that asparagus regained popularity in Europe as a luxury vegetable reserved for the tables of nobles and the various royal courts. Then in 16th century Germany ‘Spargel’ began to be cultivated around Stuttgart, and gained a nickname, ‘The Royal Vegetable’, because, as in France, it was only available to the nobility. But it was only a matter of time before all the Germany fell in love with asparagus. By the middle of the 19th century it was popular with all levels of society. The ‘Spargelzeit’ – Asparagus Season – had become and up to this day a huge event that is celebrated throughout the country. It’s all the farms that grow asparagus come every day to the main square of the towns to sell it to the public and restaurants, but when all the restaurants that offer German cuisine make up a ‘seasonal menu’ for the months of the asparagus season that is called “asparagus menu’, featuring all kinds of dishes with the asparagus. 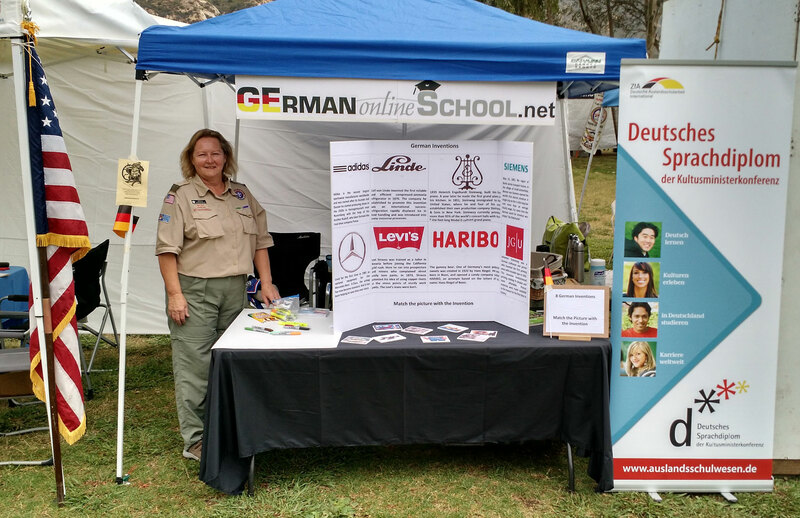 GERMANanonlineSCHOOL.net attended on Saturday April 9, 2015 the annual Scout Fair in Orange County CA. More than 25.000 scouts and their parents or adult leaders have visited this event. Ursula Schoeneich, Principal of the GERMAN SCHOOL presented the opportunities to the youth and high school students Germany has to offer and how to earn the credit in World Language in the United States. The exhibition was embedded into a knowledge test in matching 8 German inventions with the product. This annual event is extremely busy and the interest in learning German is growing from year to year. GERMAN online SCHOOL just has finished the annual testing with AATG. The results of our students where outstanding. 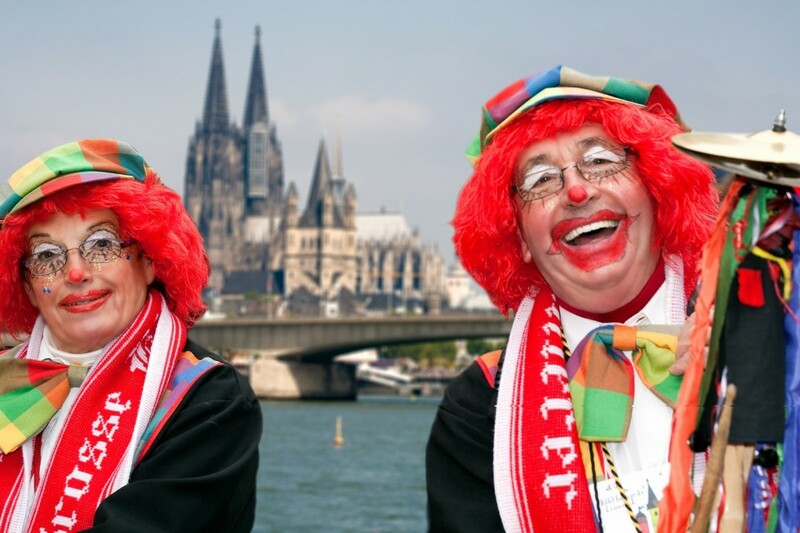 „Helau!“ und „Alaaf!“ – es ist Karneval! Fasching/Karneval: „Helau!“ und „Alaaf!“ Das sind die bekanntesten Narrenrufe, die sich die Menschen während des Karnevals zurufen. „Alaaf“ hört man besonders im Rheinland. In Düsseldorf rufen sie „Helau“. Da sich die Menschen, die am Karneval teilnehmen, oft etwas „verrückt“ benehmen, nennt man sie „Jecken“ oder „Narren“. Den Begriff Karneval benutzt man überwiegend im Rheinland. Die Städte Köln, Düsseldorf, Mainz und Aachen sind besonders bekannt für die ausgelassenen Feste rund um die Karnevalszeit. 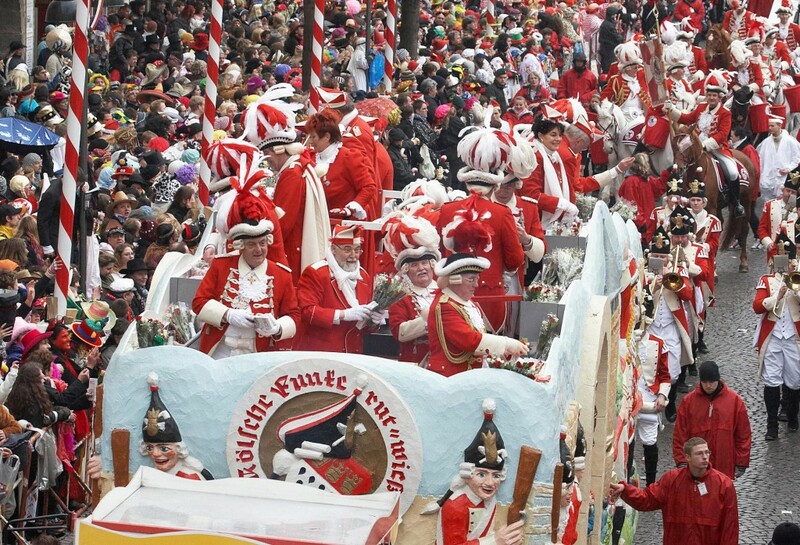 In Bayern, Thüringen und Brandenburg sagt man Fasching. Die „Fastnacht“ feiert man hauptsächlich in Franken, Hessen, Pfalz, Baden und Schwaben. Unsere Vorfahren, die alten Germanen, feierten im Frühling ein wildes Fest um die bösen Wintergeister zu vertreiben und somit die kalte Jahreszeit zu beenden. Sie setzten sich gruselige Masken auf und machten mit ihren Trommeln und Rasseln einen ohrenbetäubenden Lärm. Aus den Masken sind heute Kostüme aller Art geworden – meistens sind diese bunt und lustig. Ein zweiter Ursprung geht bis ins zwölfte Jahrhundert zurück. Um den Glauben der Menschen zu stärken, hat der Papst eine jährliche Fastenzeit zwischen Aschermittwoch und Karsamstag verordnet. Die Menschen sollten mehr beten und dafür weniger essen. Besonders Fleisch war streng verboten. Dies erklärt auch die Bezeichnung Karneval. Der Begriff kommt aus dem Lateinischen und „Carne vale“ bedeutet in etwa „Fleisch, lebe wohl“. Vor der strengen Fastenzeit haben es sich die Menschen dann noch einmal richtig gut gehen lassen und ausgiebig gegessen und gefeiert. Im alten Rom wurde früher das „Saturnalienfest“ gefeiert, welches als weiterer Ursprung für unser heutiges Karnevalsfest steht. Für einen Tag waren die Herren und ihre Sklaven „gleichgestellt“. Es kam sogar vor, dass die vornehmen Herren ihre Sklaven bedient haben. Heute spiegelt sich diese Tradition in den „Büttenreden“ wieder. Das Volk erhebt das Wort und hält lustige Reden. Dabei werden so manche Witze auf Kosten unserer Politiker und Staatsoberhäupter gemacht. Besonders im Rheinland wird die Faschingszeit ausgiebig gefeiert. Wochenlang bereiten sich Karnevalsvereine und Tanzgruppen darauf vor. Da sich die Karnevalszeit mittlerweile über mehrere Wochen/Monate zieht, spricht man sogar manchmal von der „fünften Jahreszeit“. Diese beginnt in den meisten Regionen am 11.11 um 11:11 Uhr und geht bis Aschermittwoch. Mit der Weiberfastnacht beginnt das wilde Treiben. Die Menschen verkleiden sich und feiern in den Bars und auf der Strasse. Im Rheinland gilt dieser Tag sogar als inoffizieller Feiertag. An diesem Tag ist es Tradition, dass die Frauen den Männern die Krawatten abschneiden. Als Entschädigung gibt es dafür ein kleines Bützchen (Küsschen) von den Frauen. Eine weitere Tradition an diesem Tag ist die Stürmung des Rathauses. Die Frauen „entmachten“ den Bürgermeister und übernehmen die Herrschaft – natürlich nur rein symbolisch. Der Rosenmontag fällt immer auf den Montag vor dem Aschermittwoch, 48 Tage vor dem Ostersonntag und gilt als Höhepunkt der Karnevalszeit. Kilometerlange Rosenmontagsumzüge mit aufwendig geschmückten Wagen, Tanzgruppen und Karnevalsgesellschaften ziehen durch die Straßen und werfen Kamelle in die Zuschauermenge. Kamelle werden die Süßigkeiten genannt. Das Wort kommt eigentlich von „Karamelle“ – also den klassischen Bonbons aus karamellisiertem Zucker. Ein Grund für die großzügige Verteilung der Süßigkeiten ist wahrscheinlich die bevorstehende Fastenzeit, wo diese Leckereien ja eigentlich nicht erlaubt sind. Am Faschingsdienstag (auch Veilchendienstag genannt) wird noch einmal ausgelassen gefeiert, denn dies ist der letzte Tag vor Beginn der Fastenzeit – welche heute allerdings nicht mehr so streng genommen wird wie früher. Die Rheinländer haben noch eine ganz besondere Tradition: die Nubbelverbrennung. Während der Karnevalszeit hängt über vielen Kneipen der so genannte Nubbel – eine menschengroße angekleidete Puppe aus Stroh. Diese ist eine Art Sündenbock. Das heißt, dass die Puppe für alle Sünden und Streiche der Rheinländer während der Faschingszeit herhalten muss. Mit der feierlichen Verbrennung der Puppe um Mitternacht sollen diese dann „verziehen“ werden. Am Aschermittwoch geht die Faschingszeit zu Ende und es beginnt die Fastenzeit. Diese dauert 46 Kalendertage (wobei an den Sonntagen nicht gefastet wird). Die Fastenzeit soll die Menschen an die 40 Tage erinnern, an denen Jesus betend und fastend in der Wüste verbrachte. Whether it’s landing a great job, traveling to exciting destinations, forging new friendships or learning about cutting edge technology – German is the key! Germany’s central location in Europe and strong economy make it vital in today’s world. The rich history of the German language and culture make it central to understanding the past and shaping the future. Languages play a role in our national security and economic strength, and in our ability to build mutually beneficial relationships with other cultures. We need multilingual representatives who can interact and negotiate with other countries and cultures, and doing so in other languages often can assure that meaning and intent are not lost in translation.